In June 2008, I visited the “Little C.” at Homolovi Ruins State Park, Arizona. As I approached the river, runoff from winter snows and spring rains had ceased. Ducking under a floodplain safety fence ravaged by the river, I walked out on to the rapidly drying floodplain. The remaining surface water in the riverbed collected in pools near the banks. While lingering at the edge of a large pool, I realized that I was standing in quicksand. Without warning, my sandaled feet sank up to the ankles. As I lurched to get away, gravity pulled me deeper into the liquefied sand. The viscosity of the quicksand made it difficult to move. In fright I pulled harder, lifting one foot, only to find my other foot sinking deeper into a bottomless goo. Driven by fear, I began my version of an Indian dance, rhythmically lifting and then driving each foot into the quicksand. As my dance step quickened, I arose from that hole in the Earth. Not stopping the rhythm, I padding across the shaky surface until I reached the riverbank. Looking back on that episode, I now realize new things. One is that quicksand can be deep enough to conjure pre ancestral memories of death and rebirth. Unexpectedly, I had reenacted my own version of the Hopi Indian Creation Myth. Although firsthand versions of the myth are sacred to the Hopi, there are as many translations of that myth as there are Hopi willing to tell a story to an outsider. Still, at the center of each version of the myth is a vision of the ancient Hopi people arising from a water-filled hole in the Earth. To this day, the Hopi protect their knowledge of creation both for themselves and for all of humankind. Whether one considers the Hopi story of creation to be myth or truth is not important. 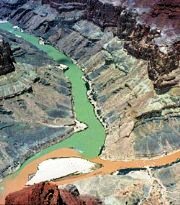 Either way, the Hopi, who are native to the lands and aquifers at the heart of the Little Colorado Basin, knew the power of water to confer both life and death. I for one was happy to be reborn that day on the banks of the Little Colorado River. After my bottomless quicksand scare, I vowed to keep moving while exploring the riverbed. As I moved and observed, the lack of surface water led me to perceive that the Little C’s flow was opposite from its actual direction. Proving the power of our belief systems, three years later, I still tend to believe that the river flows back toward its source, in the White Mountains of Arizona. Scientists tell us that only prior to the Late Triassic Period, 250 million years ago did this system of rivers and aquifers flow as my mind’s eye still perceives. Such is the power of the landscape in the desert that it brings forth pre-ancestral memories for us to ponder. The northern flank of the Little Colorado River Plateau basin ends at Navajo National Monument, near the Arizona-Utah border. Its eastern flank is near the Arizona-New Mexico state line. On the south the up-tilt of the Mogollon Rim constrains it. In the west, U.S. Highway 89 North traces its periphery. Even with its watershed of 27,000 square miles, few places within the Little Colorado River Basin offer year-round sources of surface water. According to the Arizona Department of Water Resources, aquifers of the Little Colorado River Plateau basin contain large quantities of groundwater in storage. 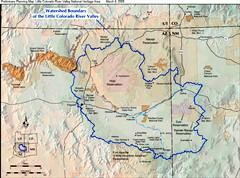 However, they are in a sensitive relationship with the Little Colorado River and its few perennial tributaries. Lowering of hydrostatic heads by excessive groundwater withdrawals may cause some perennial reaches of the streams to dry up (Mann, 1976). After thirty-five years, it seems time for an update on that research. When last surveyed, almost two decades ago, the two southern regional aquifers were still in hydrostatic equilibrium, or ‘steady-state’. However, local groundwater sinks or cones of depression were already developing in areas of heavy pumpage (Arizona Department of Water Resources, 1991) such as the paper mill near Snowflake and three of the power plants: Springerville Generating Station, Coronado Generating Station (St. Johns), and Cholla Generating Station (Joseph City/Holbrook). Of those top-four users of water in the southern aquifers, three are coal-fired power plants. According to the Food & Agriculture Organization (FAO) at the United Nations, the Little Colorado River Watershed qualifies as a Globally Important Agricultural Heritage System (GIAHS) – Following is the FAO's description of the area. In general, the outer boundaries of the Navajo Indian Reservation coincide with the outer reaches of the Little Colorado River Basin. There are two major exceptions. The southern boundary of Navajo reservation coincides with the northern boundary of Petrified Forest National Park. From there, west to Flagstaff and south to the Mogollon Rim, the land is Forest Service controlled or privately held. The other exception to Navajo hegemony over the basin is the Hopi Indian Reservation. Despite their independent tribal status, the Hopi reservation is landlocked within the larger Navajo reservation. Surface and ground waters flow between the two reservations without regard for political boundaries. Although the Navajo and Hopi stress cooperation where they can, competing claims on water rights can be a contentious issue. Among other issues, the 1996 Navajo-Hopi Land Dispute Settlement Act identified and funded the purchase of up to 500,000 acres of new Hopi Trust Lands. These 'New Lands', including attendant water rights were to come from Arizona State holdings, beyond the borders of either reservation. In exercising their rights, the Hopi subsequently purchased land and water rights within the southern reaches of the Little Colorado River Basin. Little did anyone know at the time, but Hopi Trust Lands and their concomitant water rights would soon make news again. In March 2011, the Ringbolt/Passport/Karlsson Group potash consortium obtained agreement from the Hopi Lands Trust to conduct exploratory operations on their Holbrook Basin holdings. Through that agreement, Passport Potash will have access to Hopi water rights in the southern reaches of the Little Colorado River Basin.